LEFT:Sea to Sky Trail. EMILY HAGGAR PHOTO RIGHT: Ready to go? Wet noses and warm hearts. 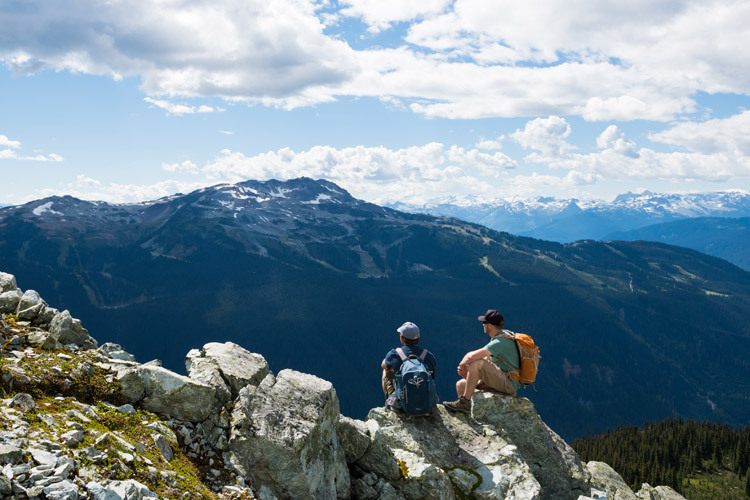 Whistler is known for being a pet-friendly community, and with a seemingly endless network of hiking options there is no shortage of places to explore with your four-legged friend. Whether your canine companion is into lengthy journeys and strenuous alpine excursions or spontaneous relaxing strolls in the forest, being able to share a beautiful day in the mountains with your favourite pup is what having a dog in Whistler is all about. And you may end up wondering who’s walking who? Thanks to a high elevation forest service access road in the Callaghan Valley (a 4×4 is best as it can get rough), this short hike leads directly to a little piece of mountain heaven. Brandywine Meadows is one huge blanket of wildflowers and grasses, stretching out below beautiful snow-capped peaks. The meadows are a great destination in their own right but there is fantastic hiking up to the summit of Brandywine Mountain as well. With so much terrain to explore, bringing along the tent to set up a basecamp for several days of mountain adventures would be the ultimate way to get to know this incredible landscape. Distance: 6 KM round trip to the meadows. Allow 3-5 hours. Difficulty: Moderate. LEFT: Skywalk Trail. RIGHT: Brandywine Meadows. EMILY HAGGAR PHOTOS. This is a fantastic option if you’re looking for a long hike with access to the alpine. Distance: Skywalk North 20.2 KM, Skywalk South: 17.1 KM (roundtrips). Allow 7-10 hours (or 2-4 hours one-way to the split/junction). Difficulty: Pretty tough. Long with moderate vertical gain. With easy access and great scenery, Riverside is a local favourite. Starting from the Cheakamus Crossing neighbourhood, this wide smooth trail follows the Cheakamus River to a suspension bridge, delivering you to the opposite side of the river. Follow the trail back to make a full circle, or for a longer outing, head up to Logger’s Lake and the beautiful Crater Rim and Ridge trails. Great for smaller or older dogs who enjoy a walk in the woods. Distance: 4 KM roundtrip to bridge and back. Allow 1.5-2 hours. Difficulty: Mellow. 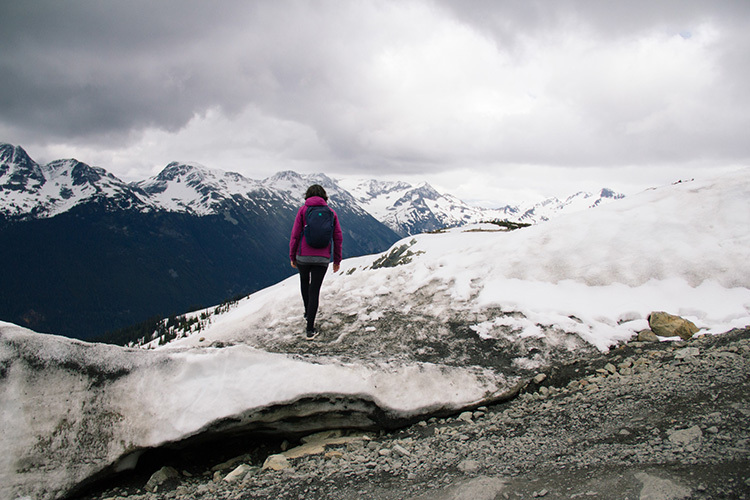 Of all the hikes listed here, Mt Currie is the most challenging. If you’ve got a Border Collie that is impossible to tire out, this might be the hike to do it. Completed just two years ago, the trailhead to Mt Currie starts about 15 minutes north of Whistler near the Green River Speedway, and ascends the south side of the mountain to an overlook above the Pemberton Valley. The trail is steep and best done in early summer when the creeks are still running. Later in the season, you’ll need to carry some extra water for your dog, as the drainages tend to dry out if there hasn’t been much rainfall. For those with extra stamina, the smooth rocky slopes above the overlook are beyond incredible in both terrain and views, serving up the ultimate camp spot. Distance: Approx 16 km round trip to the Overlook. Allow 5-8 hours return. Difficulty: Full-on with steady grades. Alpine dog house, Mount Currie. EMILY HAGGAR PHOTO. The Sea to Sky Trail is a long thread that, when completed, will connect Whistler to both Pemberton and Squamish. You can access the north end of the trail from Molly Hogan in the Lost Lake trail system, which then climbs above Green Lake and on towards Wedge Woods. From Cheakamus, the Sea to Sky Trail picks up where the Valley Trail ends, heading south towards Brandywine Falls. 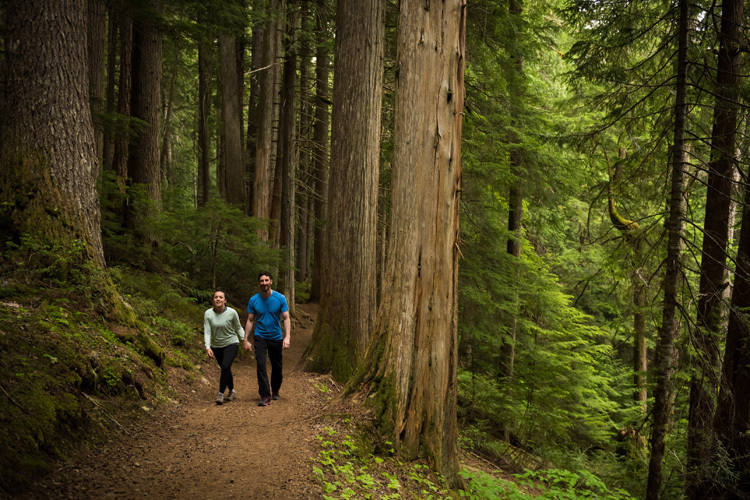 If you’re looking for a quiet, uncrowded place to hike, bike or run with your dog, the Sea to Sky Trail is a great option. Distance: You can go as far or as long as you want on this one. There are no loops so it’s hike out and retrace your path back. Lost Lake is a popular area for hiking, running and mountain biking with a four legged friend, and you’ll see the most dogs here of any hike on this list. There is a nice dog beach at the lake with a dog ramp so they can climb onto the floating dock. This is the perfect spot for a post hike swim and game of Frisbee/fetch. Lost Lake has a large network of mixed-use (hike/bike) trails, with lots of routes to explore and easy access from Whistler Village. Distance: 5 KM and upwards. Allow 2 hours for Village to lake loop + swim but there are options for longer routes. Difficulty: Easy. A Dog’s Life at Lost lake. RIGHT: EMILY HAGGAR PHOTO. This 5 KM loop is one of Whistler’s hidden gems. Rarely busy, this is a beautiful trail that leads to a grove of 1000 year old cedar trees. If you can time your walk to be there in the golden hour just before sunset, the magic of the ancients will be even more impressive. The massive trees at the end of the Ancient Cedars hike will make even a Great Dane look a shih-tzu. Distance: 5 KM round trip. Allow 1.5-3 hours round trip. Difficulty: Mostly mellow, one steep section. 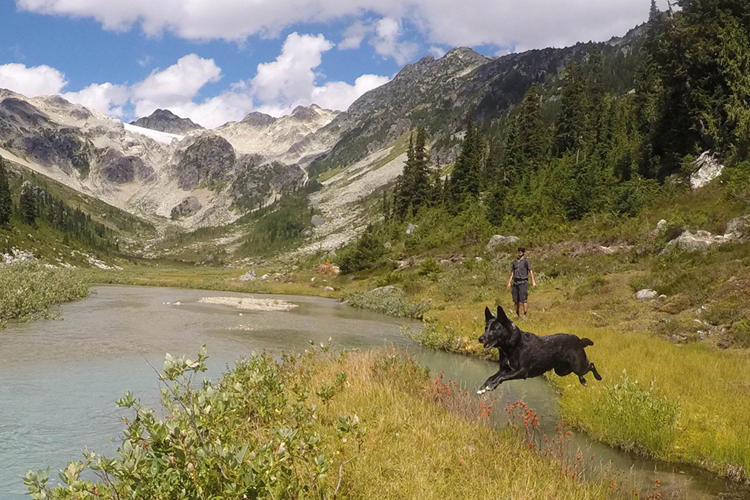 For more dog friendly options around Whistler, check out the trails in the Callaghan Valley, hike Sproat Mountain, or spend some time on the Flank trail. Both the Hurley FSR and Duffey Lake Road have literally hundreds of options for dog friendly alpine hiking, so you’d be hard pressed to run out of possibilities a bit further north of Whistler and Pemberton. Due to park regulations, dogs are not permitted anywhere in Garibaldi Park, which includes Wedgemount Lake, Garibaldi Lake, Cheakamus Lake, Musical Bumps and Elfin Lakes. Whistler Blackcomb, and the Rainbow Lake trail are also dog-free zones. LEFT: Riverside Trail. PIP CAMPBELL PHOTO. RIGHT: Joffre Lake. EMILY HAGGAR PHOTO. Wherever your adventures take you, be mindful of the wildlife and keep your dog at your side on-leash in case you encounter one of the local bears. Brandywine Meadows is in Grizzly Bear habitat, so use a little extra caution when hiking in this area. 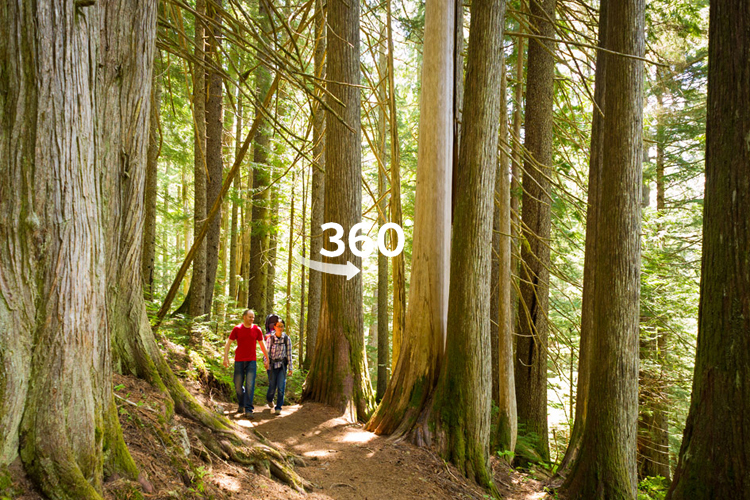 All of the trails within Whistler require you to have your dog on-leash. Perhaps most important is to practice a “Leave No Trace” principle. This is standard, respectful behaviour in any wilderness area so always remember to carry out your doggy waste bags. Lost Lake is the only area with garbage facilities, so be prepared to pack out what you bring with you. If you’re unfamiliar with the Whistler area it’s always a good idea to pop by the Whistler Visitor Centre in the Village for maps and helpful advice on hikes and anything else Whistler related. 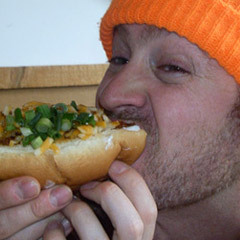 The Insider has a hiking archive full of more great hikes and info. And if you have a favourite dog friendly hike not listed here, please tell us about it in the comments below! Happy trails and wagging tails! The dog days of summer. PIP CAMPBELL PHOTOS.